Workshop description: Sparkling white landscapes, whistling winds, and crunchy snow—the winter season has its own set of unique colours, textures and sounds! 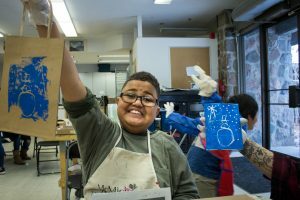 Cozy up at the McMichael this winter and enjoy a collaborative family art workshop that celebrates the beautiful characteristics of winter. Hot chocolate will be served!